These are some of the very first questions that comes to your mind when you first start hearing about online surveys, and how you can actually make money for doing surveys. Click the image to go to another page where I have listed 40 free legitimate paid survey companies! The truth of the matter is that although there are many paid survey scams out there, the industry itself is not a hoax. In fact, online surveys is just another name for market research studies, which are the backbones of consumer product creation in this and many other countries. Market research studies help manufacturers and companies learn how average consumers who use their products and services, think about these products and services, what kind of improvements they want to see for the future products, and so on. Of course, to get this information, survey companies have to offer some kind of incentives to entice people to fill out questioners and online surveys. And that is how the term “paid surveys” was born. Paid surveys offer a great way for people to earn extra cash on the Internet, and so, lots of people are very interested in taking part in these studies, so that they can make some fast cash. And that’s where scammers have come in to take advantage of such people. That’s why there are probably more paid survey scams out there, than the real thing. So, for anyone who is interested in becoming an online survey taker, it is essential to know how to distinguish between legit survey companies and scams. It is always a good idea to do some research before you join any survey company (In fact, you should always look for signs of scams when dealing anyone online – Here is a great post on how to ID online scams by OnGuardOnline.gov), as each company is unique and runs by a different sets of standards. But there are a few things you can do that in almost all cases, can help you spot a paid survey scams from a mile away. One of the best ways to find out about legitimacy of a paid survey site, is to check with The Better Business Bureau. You can use BBB to check for possible complaints against the specific paid survey site you are researching about. But keep in mind that just because there are no complaints against a specific survey site, it doesn’t mean all is ok. Sometimes it just means people who have use those sites haven’t had a chance to report a complain. Most paid survey scams sites and perhaps many other scam sites for that matter, use proxies to register their sites. By using proxies, scammers are able to hide their real contact information. Whois allows you to find out if a site was registered using proxy or not. If the site you are searching for was indeed registered using proxy, there is a good chance that the site is up to no good. And if the site is not registered through a proxy, you can at least get some detail and contact info about the given site, which you can use to further help yourself investigate the company. 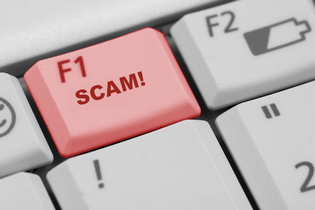 There are many great online forums dedicated to exposing scams. These are discussion boards where members talk about their experience with different sites. If you are worried about the legitimacy of a paid survey site, look for more info on forums such as Scam.com or RipOffReport.com. Chances are you will find people who have previously used the site and have experienced it first hand. Of course, like most other scenarios, scammers use these forums to promote their sites as well. So, don’t run to register with the site, as soon as you read a positive comment about a paid survey site on one of these forums. I personally tend to rely on comments from members that have been around for a while (you can see their post count and when they joined under their user name). Get paid to forums and online money-making forums such as GetPaidForum.com, are in general good places for finding out about online money-making scams. If a survey site is legitimate, chances are it will be mentioned by at least a few members. Some forums even have specific sections dedicated to individual paid survey sites, where members discuss everything from the survey invitations to rewards offered for taking the surveys, and everything in between. Get paid to forums are a great resource for separating paid survey scams from legitimate ones. I found out about two of my favorite legitimate paid survey sites Opinion outpost and Valued Opinions using online forums. Sometime all it takes to find out if a survey site is legitimate or scam, is to simply Google it! If it is a scam, chances are you will know it in a few minutes. A lot of times, people who have been scammed, leave comment or complain on other related blogs or websites, and a simple search can reveal them. After all, when it comes to revealing scams, nothing comes close to word of mouth. When it comes to paid surveys, just like any other online money-making method, you have to be vigilant and stay alert. The fact is, our Internet is full of scam and scammers who are waiting to take advantage of any opportunity that comes around, to rip us off. Now, while I do not have a paid surveys scam list, I do have a list of top legitmiate survey companies you can register with to earn extra money. Here it is: Scam Free Paid Surveys. It may take a few extra minutes to find legitimate paid survey sites. But sometimes, spending a little time researching, before getting involved with a paid survey site, can save you a lot of time and money, not to mention the disappointment and frustration that comes with being a victim of paid surveys scams.